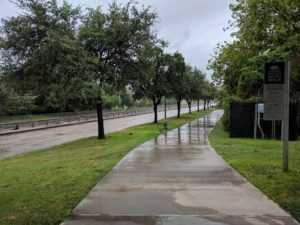 Before, during, and after Hurricane Harvey, I made my way around Buffalo Bayou and downtown. Kept it safe, fun, and able to see parts of my city flooded like I never seen before. 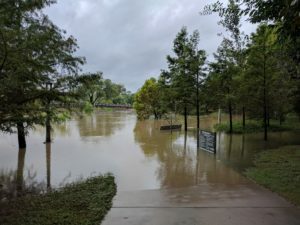 It was the calm before the storm and I decided to take a lap around Buffalo Bayou. I didn’t really plan to document the storm. I didn’t even know about it until Wednesday and had no idea what to expect. We’ve already had three storms in the past two years that caused major flooding, no way we could get another, right? During the evening, we all watched Harvey grow in strength and slam Rockport and the Corpus Christi area as a Category 4 hurricane. I followed Jeff Piotrowski‘s live stream and man it was scary. We got a lot of rain overnight and it seemed like everything was over in our area. Looking at the radar, it was just the first rainband from Harvey and the gap to the next was a couple hours. I took advantage of this and attempted another bike ride around Buffalo, no luck. I had to take a bunch of detours. It was impressive to see how much water was dumped in just on evening. Many thought it was over. Many didn’t realize it was just the start of the chaos. This morning, we found a gap from rainfall to venture out into the storm. We made our way into downtown, but the rain got too heavy and we decided it was best head back and stay indoors for the rest of the day. I spent most of my time staring at charts, graphs, gauges, maps, and following the Reddit Live Thread. 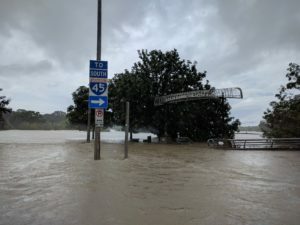 Before I went to bed, there was a gap in rain and I made my a couple blocks out to see downtown and amazed to see to see how high the water got. Water receded a bit over night. I got a little anxious, so I took a walk around the area. 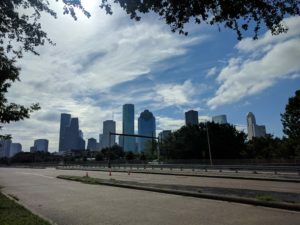 This time, I was able to get into downtown and up to UH Downtown. This has a great view of the city, including parts of the park – completely submerged in water. After reading about all the craziness, a group of us attempted to volunteer at the GRB. There was an overwhelming turnout for volunteers. After registering and going through orientation, we talked with a few coordinators and thought it would be best for us to return at 7 PM, when they have a light number of overnight volunteers. After some rest and a nap, we returned to the GRB and the volunteering line was twice as long as before, WOW. After waiting in line for quite some time, we got near the front and they announced they were at capacity for volunteers for the evening. I’m amazed to see how many people were ready to help out when our city needed them most! I woke up this morning and the sun was out! Instead of attempting to help out at the large mass shelters, my brother and I helped out in the morning at our the Houston Police Officers Union near our house and the retirement facility on the other side of the neighborhood. We finished around lunch time and I took a bike ride around the area. It’s insane to see the amount of water still lingering. Houston’s infamous August heat and humidity got the best of me, and I cut the adventure short and went home to rest. 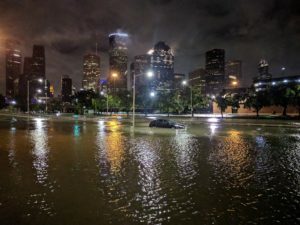 You are currently reading Hurricane Harvey Photo Album at thomas nguyen.